No More Pants For Wonder Woman? And apparently DC has confirmed that this pantsless version is the official cover. I guess this “pants for everyone” edict is falling by the wayside. Wonder Woman is wearing pants in all of the Justice League promo art, but since that book is set earlier than the rest of the DCnU (and presumably Wonder Woman) a different costume isn’t really a concern. But still, brandingwise, a bunch of different outfits doesn’t seem like the smartest call. I really don’t care about the pants one way or the other, though I think the black boots look a little silly now. I can understand the appeal of both styles… the briefs are classic and iconic, while the pants are practical. 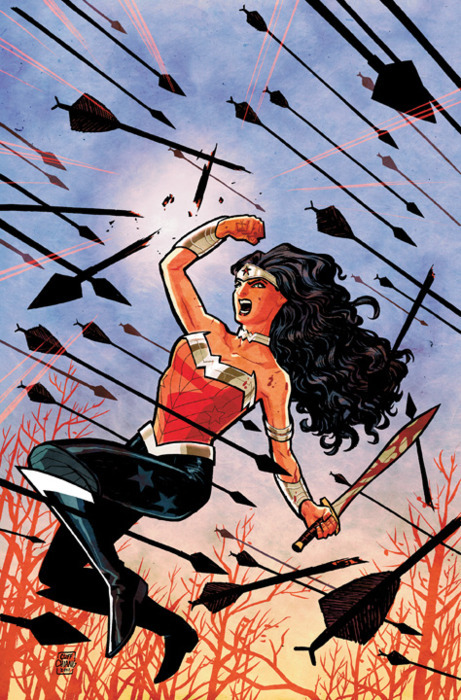 Either way, Azzarello and Chiang on Wonder Woman has MAD potential, and I can’t wait for the book to come out!! 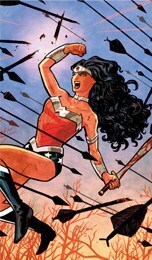 This entry was posted on July 13, 2011 at 3:39 pm and is filed under Comics, WW Comics. You can follow any responses to this entry through the RSS 2.0 feed. You can leave a response, or trackback from your own site.